All window boxes need to be filled with plants that thrive in each particular environment. For example, a sunny, south facing aspect is ideal for drought tolerant plants such as lavender and most herbs. North facing sills would benefit from some splashes of colour in the summer months with favourite annuals such as Pelargoniums and Busy Lizzies. Once the frost arrives, the window boxes can be changed to an evergreen display of Buxus and ivy for the winter months. 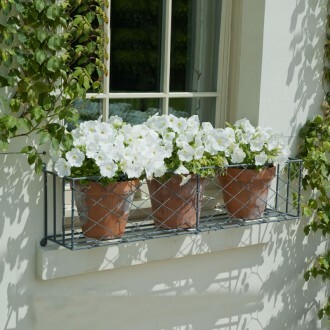 All window boxes need to be filled with appropriate pots as well as plants. Terracotta, especially old ones, provide a lovely contrast behind the wire latticework but can crack in frosty conditions if they’re saturated with moisture. Plastic containers are functional but nor very stylish, whereas metal pots in zinc or steel are a good solution for most window box designs. For details of our window box styles, advice on measuring your windows or to order, please call us on 01225 851577.